This short course is a lot of tips to share on how to phrase ideas and express it in a smooth flow. It’s a hands-on training with exercises that allow everyone to speak during the session. Ms. Sheila uses simple examples and easy to remember tips. I learned a lot about communicating since I am a shy person. The program design is excellent. I like most the activities for we were able to practice them. Ms. Sheila Viesca is professional and excellent. I learned the way to talk to other people and the basic story telling. I learned important things which I can really practice and observe during client meetings. I like the activities. They make participants comfortable. 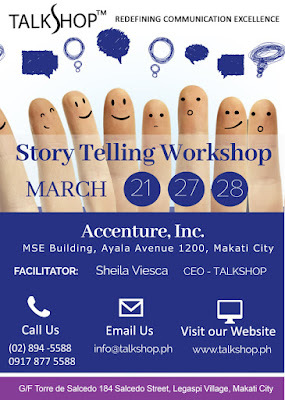 TalkShop Consultant, Ms. Sheila Viesca is excellent. Structuring thought and how to have good impression is the transformative effect of TalkShop’s program. This is a 5-rating workshop with TalkShop. I like everything, the sharing and the Speaker. Ms. Sheila Viesca is very good. She’s able to give relatable examples and references. I now have confidence and coherent story telling. Talking exercises are pretty much the highlights of this activity. I enjoyed listening to all of the ladies and also had fun with its sharing my own thoughts and experiences. I learned how to effectively tell a story using the formula. I like storytelling the most. Ms. Sheila Viesca is a very effective Speaker. The workshop somehow helped me increase my confidence in public speaking. The workshop is lively and interactive. The Speaker is approachable and can relate to realities of life. The program design is very good. There are a lot of examples from attendees. I like the 2 truths and a lie because it gives me opportunity to speak in front. Ms. Sheila Viesca is very confident and very real giving true to life examples. I am now aware of my visual, voice and verbal. Thank you for giving us opportunity to develop myself and enhance confidence. I rated TalkShop excellent because it gives me more confidence in my frame works and how to be a good employee and a leader. The program design is great. I like the part on how to communicate with other people with the right manner and to have good behavior in every circumstance. Ms. Sheila is great. She can deliver well and inspire people by her examples and words. I like the format of the training. The Speaker is really effective. She managed the training well. The program design is really good. I enjoyed it. Ms. Sheila is a good Trainer. I was never bored. I feel more confident in talking now. I’m excited to try my superhero role in the next challenging meeting I shall have.